This is such big news, that I decided to lead with it. The last of couple days have seen some significant changes at Fissure 8 in Leilani Estates and at Halemaumau at the Kilauea Caldera. As you will see from the recent data, the eruption has had a major impact on Hawaii real estate, so this is obviously great news. Beginning Saturday, field observations and drone overflights indicated “reduced output” from Fissure 8. By late Saturday afternoon, the lava river, which had once been a vigorous liquid flow moving over 30 mph, had become a very slow moving flow of A’a (chunky hardened cooler lava). The latest report, issued by Hawaii County Civil Defense only a couple hours before this writing (Sunday evening) stated the there was no lava moving in the lava river channel. At the heart of the eruption, the cone at Fissure 8, there is still some lava spattering, but the lava fountains of 200ft have stopped. At the summit of Kilauea, the rhythm of the last couple months of 5.2 magnitude earthquakes every 36 hours has also stopped. There has not been a magnitude 5 or greater earthquake in over 3 and a half days, and the magnitude 2 earthquakes, which were numbering in the hundreds per hour, now happen at a rate of a few per hour. What’s next is anyone’s guess. This could be the end of the Fissure 8 flow or it could be a pause. A few weeks ago, the USGS issued the guidance that the volcano showed no signs of slowing and could a) go on for months or years, b) stop at any time, or c) stop and start again. While that covers every scenario (and was certainly good for a laugh) it offers little help. The volcano is going to do what it wants to do. However, this latest activity, or lack thereof, is very reminiscent of the 1955 Kapoho flow in the same area. That flow lasted 3 months (we are at just over 3 months with the current eruption) and then stopped all activity on the island until the 1960 Kapoho eruption. That was the last eruption in the Lower East Rift Zone until the recent activity. The 1969-1974 Mauna Ulu Eruption and the 1982-2018 Pu’u O’o Eruption took place with less vigor in the National Park. One other change is that the now empty cinder cone at Pu’u O’o has been seeing increased rates of sulfur dioxide emissions. So while there is less lava, there is still the gas which causes vog. For the latest information on the activity, you can visit the USGS website which has the latest update and photos, videos, earthquake data, webcams, and links to flow maps. Another good source is this YouTube feed with live earthquake data and live webcam views. The North Kona market, was severely impacted in July, likely due to the volcanic activity. Remember, properties complete the sales process 30-60 days after the contract is executed. The numbers we see here indicate how much the market decreased when the eruption was in its early stages. The number of sales decreased at a record pace, down nearly 50%. Prices however, were only slightly lower. I believe that we see the flow through two different perspectives. First, buyers are in a wait and see mode, and are not committing to buying in the number we had been seeing this year. Sellers, are hesitant to drop their prices for fear that the eruption will end soon, making their net profit lower for what turned out to be a temporary situation. 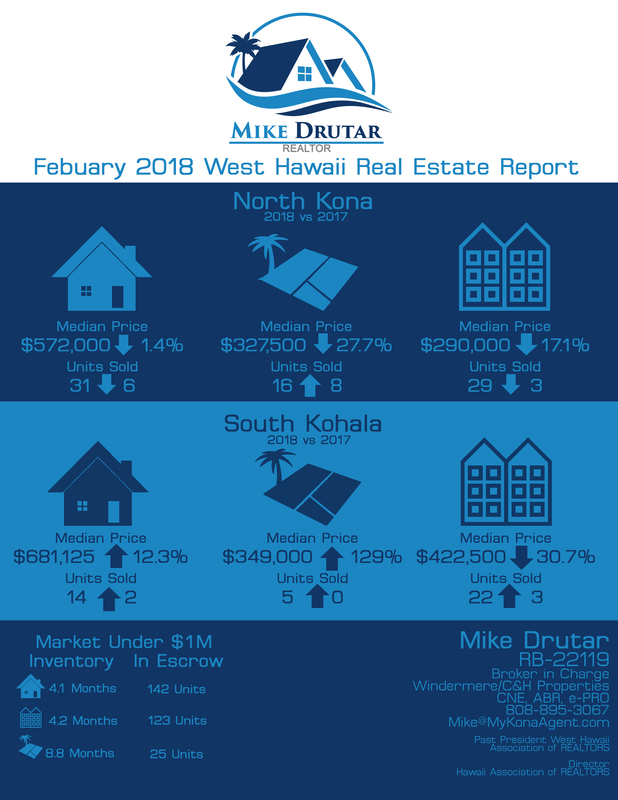 The South Kohala market was impacted much less with a decrease in the number of condos sold (which tend to be investment and vacation properties), but an increase in the residential sales (which tend to be owner occupant). As you might expect, this has increased the inventory metric. However, inventory is measured as available listings divided by sales last month. So while inventory is up, it does not mean there are more properties listed in this case, but rather fewer sales last month. Below, we look at units sold in the last 90 days, at the end of each month since January 2015. This was a chart we looked at last month. At first blush from the information above, all looks well with West Hawaii Real Estate market. Units sold for the quarter are up in total over a year ago, and 5 of the 6 categories tracked continued to see upward price growth. But we must put the picture in the frame. Data on closed sales are based on contracts written, generally, 30-60 days before the sale closes and is reported. Additionally, when we look at a longer timeline like a quarter, we may be smoothing the most recent data. Some of these reported sales are from offers written in February. Of course, that would not take the volcanic activity into account, so let’s dig a little deeper than usual. June is the first month when we can expect to see the results of the volcanic activity on closings. When we combine North Kona and South Kohala residential and condos, we saw a very small decrease in the number of units sold, only four fewer sales in June 2018 vs June 2017. Let’s first look at the monthly change of units sold over the same month for the previous year. We see here that indeed, June was down slightly. However, we have had 3 other months in the last year that were down over the previous year. Because this tracks changes it is important the remember that we are really measuring growth in units sold. We could have a great run and see big increases in units sold for a period of time, and then see no growth. That would not mean that the market is down, just that the growth has stopped while activity is still high. It appears from this chart that we are coming off a period of growth and entering a stabilization phase. Next, let’s look over the past few June’s so that we can take seasonality into account. Here we can see that while June 2018 was lower than June 2017, June 2017 was a recent record for the month, with only 2010 even coming close. From this chart, it looks like we are sustaining previous gains. So, June of 2018 was down only 4 units from June of 2017, which was a record. Below, we look at units sold in the last 90 days, at the end of each month since January 2015. What I like about this chart is that we can see that the 90 count will usually peak in May and then taper off losing some of the gains until the next year when the cycle repeats. This will be an interesting chart to look at over the next couple months as we will be able to see how much the count goes down this year as compared to previous years. Here we look at the same data as above, but with each year as its own line. The chart below has a very important line. The blue line represents the “pending ratio”, which is the number of escrows per 100 listings for the Kona residential market. You will very clearly see that the number of houses in escrow has fallen off a cliff, and it’s not seasonal at this rate. The last time we had a ratio lower for June was in 2011 when the median price was $299,000 lower. Why do we watch this line? Because when the market changed and prices dropped from their 2006 peak, that drop was preceded by a drop in units sold 20 months earlier. The lesson: a prolonged decrease in units sold may predict lower prices. Now, we have to take to volcano into account here. Things can change drastically and go back the other way if the flow stops in a few months. Things can change slowly as people become accustomed to the situation with the volcano being the new normal. Over in East Hawaii (Puna, South Hilo, North Hilo residential), they are seeing a rise in demand for rental houses, and their pending ratio is 56 which is higher than we have seen in West Hawaii since 2014. Here is how I see West Hawaii being impacted in the future. For the people buying luxury properties where it’s all about the view, we will see a decline in units sold as long as the volcano is flowing strong and creating higher levels of vog than we are accustomed to. If the volcano stops all together, like it did for a few decades after the Kapoho 1955 eruption, we will see minimal if any vog impact which would be a positive influence. In the under $1M price point, I think we have a lot of people sitting on the sidelines for now, waiting to see if this is a 3-6 month situation, or a long term change. I believe there will be an impact for the vacation rental market, which will lower the value of those properties in the near future. I also think we could see a decrease in the premium for “landlord” houses; properties with 2 or 3 units used primarily as long term rentals, which are often used by people who work in the tourism service industry. With fewer tourists comes fewer dollars and fewer jobs for those renters, lowering the amount of rent they can pay, which then lowers the return on investment for the landlord. Now, I’d like to add some anecdotal evidence. You will see below that since last month, three of my six listings have gone into escrow. People are still buying and selling in West Hawaii, and the market is by no means shut off. My take is the people who a very familiar with West Hawaii are not very affected by the news. Nobody is trying to “dump” their properties, and I have yet to see a big increase in the number of listings.